Let’s find out together what Embertone – known for their detailed sampling approach and user-friendly programming – can add to the sound and playability of one of the world’s most sampled grand pianos. 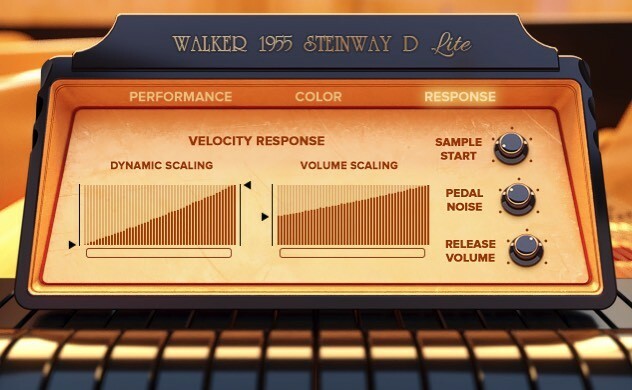 Walker 1955 Steinway D is a sample library for Native Instruments’ free KONTAKT Player 5.7+. First things first: Walker 1955 Steinway D is an absolute beast of an instrument, boasting roughly 200!! gigabytes worth of samples in its full version. Though considerably smaller, the 30GB ‘standard’ version of the library is still pretty large, which hints at the detail that was captured during the sampling of the 50’s Steinway D grand piano. Partly responsible for the product’s remarkable size is its multitude of available microphone positions apparent in the full version. The selection includes stereo close mics, room mics, a wide stereo setup, a mic position pointed directly at the piano’s hammers as well as a binaural microphone setup. The standard edition of the library comes with only one default microphone position composed of a pair of AKG C414s located two feet off the curve of the piano. Walker 1955 Steinway D comes in various different configurations regarding the available microphone positions. As mentioned, the standard version features one main mic pair while the full version gives access to all 6. You can however purchase each microphone position of the full version individually from Embertone’s web shop. This enables you to only pay for the sounds you really need. Another factor that contributes to the size and detail of the library, is the incredible amount of velocity layers and release samples captured for each microphone and pedal position. In the case of a piano, a release sample describes the sound you hear when you let go of a pressed key. This sound is usually characterized by the dampening of the piano strings and the internal mechanics of the instrument. While many other sampled pianos feature only a fixed set of release samples that are randomly selected, Embertone applied a lot of effort recording a release sound for every key and depending on how hard and how long the key was pressed before. According to the developers, this contributes to a hyper-realistic playing experience. Apart from the normal sustain articulation of the grand piano, Embertone also sampled a complete staccato articulation set with up to 36 velocity layers that is well-suited for fast rhythmic and melodic lines. 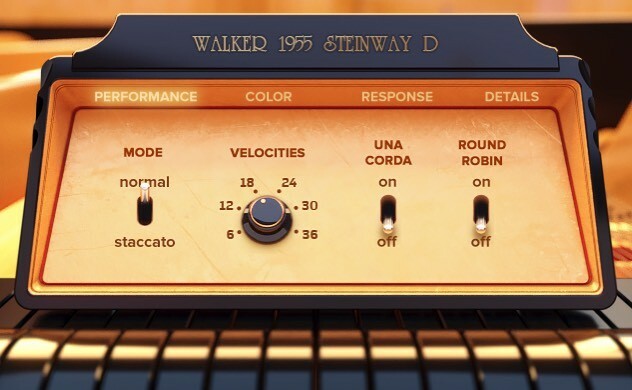 Going even further, the Walker 1955 Steinway D was recorded in both the standard, pedal-up position as well as with the sustain pedal and the soft pedal (‘Una Corda’) pushed down. All pedal positions can be individually controlled via MIDI CC. 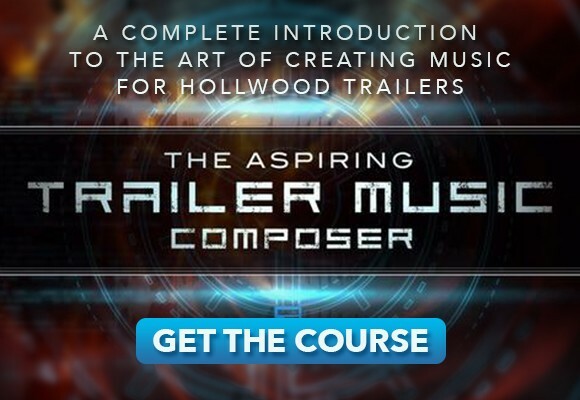 As you can imagine, this comprehensive set of sounds yields an astonishingly versatile palette of piano tones and expressive options – just as you would sit in front of the real deal. One thing I really love about Embertone’s products is that while their instruments might be most complex under the hood in terms of sampling and programming, the developers always manage to digest all those complicated things down to a simple and clear interface. Of course, this is also true for the Walker 1955 Steinway D.
Since Embertone’s Alex Davis pointed out all the instrument’s functions and controls in a comprehensive and enjoyable 30-minute walkthrough of the piano (find it at the end of the article), I’d like to save us some time and only go about the most important features and the ones that stuck out to me when testing the library. When you open the instrument you gain access to a neatly arranged main interface, featuring only 4 controls. From here, you can switch between sustain and staccato articulations, choose the amount of velocity layers loaded, turn on or off the Una Corda pedal position as well as the use of Round Robins. The velocity knob controls the amount of velocity layers per key. While a high number of velocities comes in handy for expressive, dynamic performances, you’re able to dial this control down to save some RAM. The next interface tabs deal with the color and response of the grand piano and allow control over an EQ, reverb, some tone sweetening options as well as over the piano’s velocity response. The velocity and volume response functions enable you to adjust the piano’s response curve to your playing style. Very useful if you want to reach the high velocity tones of the piano by playing softly or to restrict the expression range of the piano to its soft tones, no matter how hard you hit the keys. 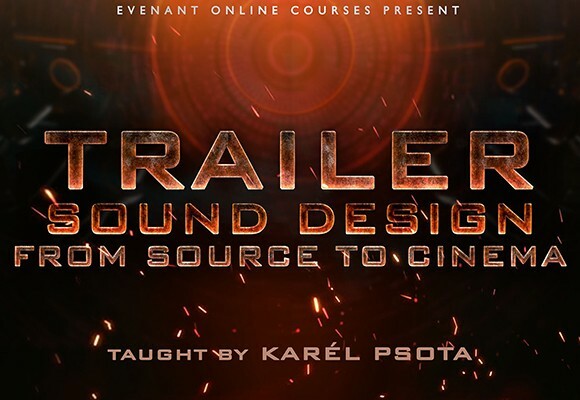 The latter option is great for an upfront cinematic drama type of sound. In the final tab called ‘Details’, Embertone allows you to purge samples for the individual pedals and articulation. This is very thoughtfully implemented because depending on the microphones and amount of velocity layers you choose, the virtual instrument can eat quite a lot of RAM. The ‘Details’ tab is also the place to assign MIDI CC to the different pedals if you want to. 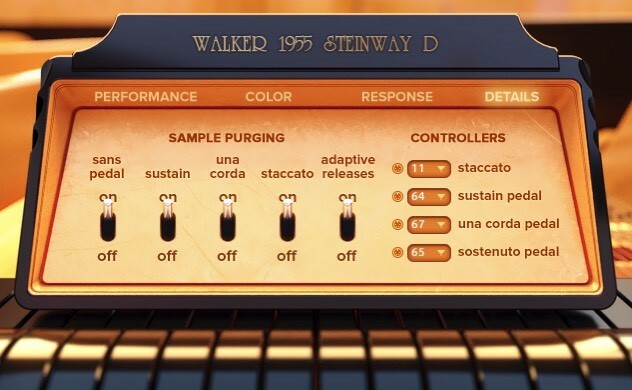 Lastly, Walker 1955 Steinway D comes with a selection of pre-designed snapshots, accessible through Kontakt’s Snapshot Menu. 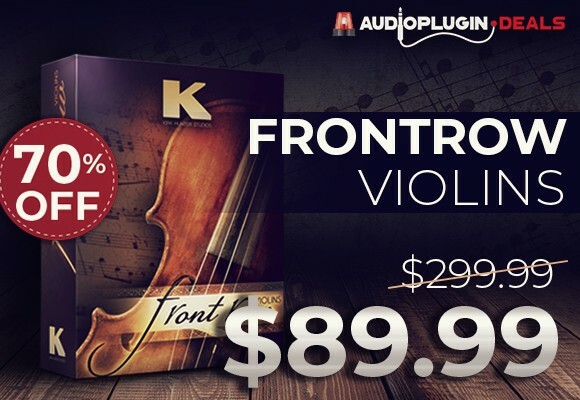 These presets provide great starting points for piano tones of different genres and styles. 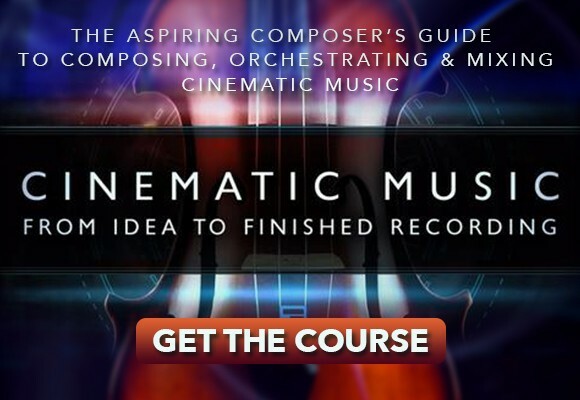 Here you’ll find everything from a classical piano sound, to a washy cinematic tone right up to your go-to Top 40 pop piano sound. Of course, you can modify these presets or create and store your own snapshots, too. If I had to summarize Embertone’s version of the 1955 Steinway D in one word, it would be ‘balanced’. The piano’s sound is very well-balanced both in itself as well as across the different tonal registers. By default, you get a classic grand piano sound that surely has character but at the same time brings enough clarity to serve as an all-round workhorse for many genres. While the low notes are strong and powerful, they don’t drown the piano in a muddy cloud of bass when played loudly. In the lower dynamics, the low keys give you an intimately warm, woody sound. The higher register notes provide you with a pearly sheen and subtle bite depending on your playing style. The overall piano sound feels wonderfully natural and un-hyped, while at the same time providing just the right amount of modern tone to make it cut through a contemporary mix. In contrast to other, similar libraries on the market that either present a piano sound that’s too clinical/artificial or too vibey, Embertone successfully walks the rope between character and definition. What’s more, apart from the amazing, all-round out-of-the-box sound you get with the standard main stereo mic position, the additional microphone selection offers even more tonal options to shape your sound with. The Neumann U87 close mic configuration features a slightly brighter and more direct sound that is well-suited for any pop or rock arrangement. The Superlux mics pointed at the piano’s hammers provide a really intimate, upfront sound that accentuates the hammers hitting the instrument’s strings. I particularly like the sound of the Schoeps CMC 6 room mic setup as it features a nice sense of space while retaining more than enough detail and clarity. The Octava stereo pair that the wide perspective setup was captured with, displays the full width of the piano and lends itself well to a larger than life sound for solo performances. Finally the binaural microphone reproduces a very clear and rounded tone from the player’s perspective, also well-suited to almost every kind of genre. There is currently no option to blend microphone positions which is probably due to the sample size of each one (30GB per position). In contrast to other piano libraries on the market though, there is not just one main microphone you can add other auxiliary positions to. Each microphone position provided is a main mic of its own right and it’s just about the color and tone you wish to achieve. As I mentioned in the beginning, Walker 1955 Steinway D was sampled with various pedal positions that modify the sound and sustain of the instrument significantly. When playing the piano, I really like to make use of the sustain pedal to shape the sound. With some virtual pianos though, you get an extremely washed out and uncontrollable sustain sound that feels like a thick rug of frequencies. Not so with Embertone’s piano. The notes surely are prolonged, but nicely retain their clarity and shine. The Una Corda pedal shifts the mechanics of a grand piano to the side and forces the hammers to only hit one string per key instead of the usual three. Switching on the virtual instrument’s Una Corda pedal via the main menu transforms the powerful and bright tone of the instrument to a very soft, warm and intimate sound literally made for cinematic music. An absolute highlight of the Walker 1955 Steinway D! At the beginning of the article I pointed out that Embertone sampled over 10,000 release samples which adapt to the way you play the instrument. Short, loud notes render other release samples than softly played long chords. There’s nothing you have to look out for since the smart scripting of the library adapts to your performance seamlessly. This is a real standout feature of the product as it boosts the realism and authentic feel of virtual piano playing to a whole new level. With Walker 1955 Steinway D, Embertone knocked it out of the park in terms of realism, flexibility and playability. The amazing sound of this classic grand piano is captured masterfully and delivers just the right balance between modern clarity and vintage character. The different microphone positions available either as a whole or individually provide great flexibility regarding tone and space. The effort of sampling tenths of thousands of release samples does make itself felt and adds massively to the playing experience. With a painstakingly attention to detail and user friendliness, Embertone delivers a virtual piano that might very well set a new standard for piano sampling. On top of all this, Embertone’s Walker 1955 Steinway D is settled at a price range that very much outdoes most of the comparable libraries on the market today. 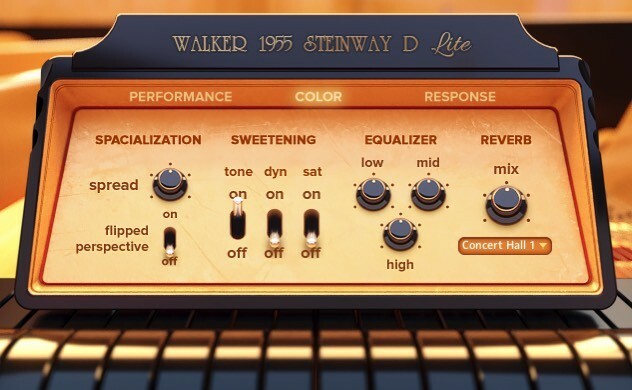 The standard version of Walker 1955 Steinway D priced at $99 comes with one main microphone setup while the full version of the library including further 5 mics is $149. If you bought the standard version, you can add any of the full version’s microphone positions to your palette for just $15 each.